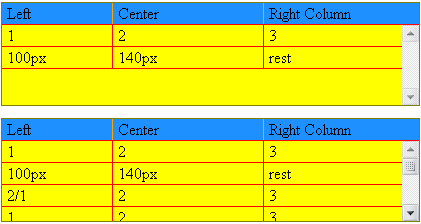 Note: the columns from 1..last-1 must have a predefined width. The only difference between the previous structure and this one is the width of the #tbody (417px instead of 400px), and table (400px instead of 100%). The idea with width:100% for the table was nice, but forced to use 'css hacks'. With the fixed width for the table, even IE7 with overflow-y:auto for #tbody shows the scroll bar. Note: the difference in 17px is the predefined size for the scroll bar. That means: the width of the #tbody is the width of the table + 17px, or opposite - the width of the table is the width of the #tbody - 17px. Note: padding-left/right and width of the header columns. The width of the #thead and #tbody is same. The CSS for the header is absolutely same as previous structure, just a correction for the width of #header. The first one is to change overflow-y:auto for the #tbody for overflow-y:scroll; overflow-x:hidden;}. In this case I need the only one css hack for the Opera v:< 9.5. The horizontal scroll bar for the old Opera will be permanent. Note: the order of these two statements is important! The newvest Opera will work as we expected.